Each year the Goldman Environmental Foundation awards six lucky grassroots activists $175,000 each in recognition and in support of their efforts. This year’s winners were honored on April 20 at the San Francisco Opera House in a beautifully choreographed event introduced by Susie Gellman, the daughter of Richard and Rhoda Goldman, and hosted by journalist Dana King. Each of the winners was featured in a short film about their struggle, narrated by Robert Redford. Then the winners, gathered from all over the world, gave a brief speech. There is no doubt of their courage, commitment and vision. Each winner is something of an environmental hero: Some faced death threats, prison or loss of livelihood for standing up for their communities’ safety and survival. And in every case, the adversary was their own governments. Read on to meet them. A copper mine in British Columbia, approved by the provincial government, would have destroyed the Xeni Gwet’in tribe’s land, drinking water and livelihoods. The detrimental impact of mining on the environment is devastating, pervasive, long-lasting, and well-known by both mining companies and governments. In a spine-tingling scene in the film, Marilyn Baptist, then chief of the Xeni Gwet’in, stood alone in the middle of a narrow, tree-lined dirt road leading to the site of the proposed mine -- where she dared the mining company’s trucks to either turn back or run her down. They turned back. Faced with protests from tribal groups and scientists, the British Columbian government eventually backed away from the mining project and is now helping to turn the area targeted for mining into a permanently protected tribal park. Originally hired to prepare an environmental impact report for the local metal refinery, Omido soon discovered that the lead released by the refinery was sickening those living nearby. She recommended closing the plant, and the single mother was fired from her job. Lead poisoning was rife near the refinery, especially among the children — including Omido’s infant son. Lead poisoning is particularly toxic to children, causing potentially permanent learning and behavior disorders. No longer working for the refinery, Omido kept up her campaign to shut down the plant to save her son and her community. She received death threats; the local authorities accused her of inciting violence and threw her in jail. She didn’t stop. Finally, the pressure from her campaign and the community forced the closure of the plant and a commitment from the government to clean up the pollution. Myint Zaw led a national campaign to stop the Myanmar government from damming the Irrawaddy River. The dam would have wiped out the economy of those living downstream, while 90 percent of the energy generated would have been sent to China. Americans are used to such campaigns and either support, fight or ignore them, but in Myanmar such campaigns are potentially dangerous. Zaw came up with the brilliant idea of flash art exhibits — put up in the morning, gone by the afternoon — that communicated the danger of the dam to the public while avoiding the notice of the authorities. Added to the exhibits were social media and email. Soon artists of all types were creating their own contributions to the campaign in song, dance, poetry and visual art. The very unusual public communication program inspired and led by Zaw has so far stopped the building of the dam. For over 20 years, he has been spinning his magic in developing new ways for Haitians to earn money -- setting up organizations that hire local residents and urging his ever-changing government to support his efforts. Haiti now has two official Marine Protected Areas. Weiner’s job going forward is to be sure they stay protected. Berta Caceres has been an activist in Honduras since her student days in the 1980s, so she was the obvious go-to person when citizens of Rio Blanco wanted to find out why heavy equipment was moving into their community. Caceres discovered that a joint venture between Honduras and China, funded by the World Bank, had been formed to dam the river. During more than a year of protests, the promoters of the Agua Zarca Dam project bribed local leaders, killed at least two people and threatened many others, including Caceres. The project was shut down due to the continuing protests and the withdrawal of World Bank funding, but Berta is still receiving death threats. A lifetime of diving off the Isle of Arran, located on the west coast of Scotland, made it clear to Howard Wood that the diversity and richness of this underwater kingdom was gradually disappearing, gobbled up by unrestrained commercial fishing. Wood and his friend, Don MacNeish, co-founded the Community of Arran Seabed Trust (COAST), which recruited both divers and scientists to identify key areas for sea life regeneration. In 2012, Wood and COAST submitted a proposal to designate the South Arran Sea as a Marine Protected Area. The Scottish government designated 30 new MPAs, including Wood’s South Arran MPA. He is now working to set policy to recognize a community’s right to share management of its seas, a challenge when the European Union is trying to open all coasts to all EU countries. From neglect and lack of interest to life-threatening attacks, all the Goldman Environmental Prize winners faced the dangerous intersection of power and money — and won. Politicians want to keep their posts, corporations (or other governments) give them the money they need to stay in office and expect favors in return. These favors often mean turning a blind eye to activities that harm their own citizens. In a perfect world, governments would protect their people and not allow corporations or outside forces to set up massively destructive projects. 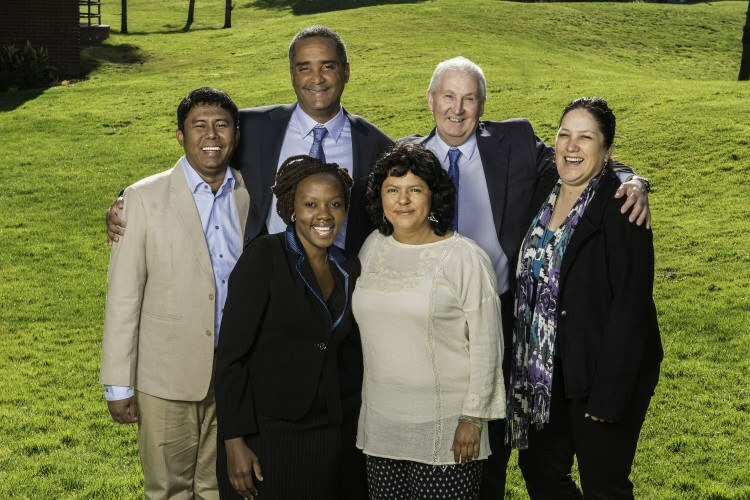 But we don’t live in a perfect world — and what stands between us and them are the 169 Goldman Environmental Prize winners committed to saving our world. Priscilla Burgess is CEO of Bellwether Materials.